Please log on to our scheduling site “Peekabu Yoga & A1-11 Yoga” to view live schedule and sign up and pay for classes. 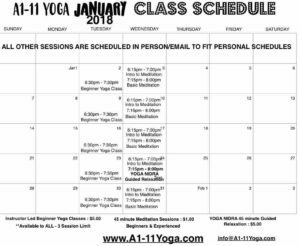 If you are new to yoga or have not practiced yoga for some time and need to ease back in, this is the class for you. This yoga class will introduce you to the true meaning of yoga and get you in tune with what your body is capable of. As a new client, whether beginner or experienced you can ONLY take a maximum of three of these Beginner classes. Then you will be ready for the next phase of your journey. See you on your mat. Please Note: This class offering time and days of the week changes from month to month and with limited space when they are scheduled. So Pre-Registration & Payment will guarantee a space in this class for you. NOTE: Beginner Yoga Classes no longer require pre-approval. Simply sign up as a client on-line at Peekabu Yoga & A1-11 Yoga and follow instructions for the beginner classes.